The Mamiya C330 is a very capable twin-lens reflex with interchangeable lenses. Made from 1969 to 1974, the Mamiya C330 twin lens reflex belongs to a very long and successful line of twin-lens reflex cameras from the japanese manufacturer. It was very appreciated by amateurs as well as professionals, particularly wedding photographers. It has a wide range of interchangeable lenses (from 55 to 250 mm) and accessories (prism viewfinder with or without light metering, handles...) The one shown on the picture has a 105 mm DS f/3.5 lens and the standard viewfinder hood, without light meter. The square format is a bit disturbing at first but is a real pleasure when one is used to it. The Mamiya C330 is a very capable camera : picture superposition, 120 and 220 rollfilm compatibility, and, as it is fully mechanical, it doesn't require any battery. The very good Mamiya Sekor lenses all have their own central shutter with flash-sync (X and M) at all speeds. 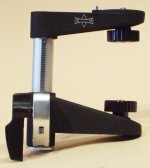 The viewfinder displays an automatic parallax indcator and accept interchangeable viewing screens. Much cheaper than a 6 x 6 cm single lens reflex, the Mamiya C330 is the perfect medium format camera on a budget. It was followed by the C330f and C330s with small improvements which were built until 1994. The C220 is a more simple, cheaper and lighter version. 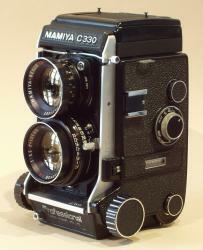 Beneath its crude looks, the Mamiya C330 hides efficient ergonomics. The controls are adequately placed. A clever conception prevents any manipulation mistakes, from unwanted double exposure to the dangers of lens switching. Its perfect build make for a flawless operation. 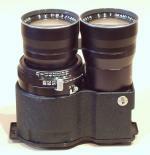 The twin-lens reflex design makes it very quiet as there is no need to flip the mirror when shooting. On the other hand, there is a parallax due to the distance between the viewing and taking lenses. An automatic mobile indicator shows this parallax directly in the viewfinder. A special accessory, the Paramender, is also designed to compensate for this. With its built-in bellows and the Paramender, the C330 has a very interesting macrophotography capacity. The clear viewfinder allows accurate focusing. It is sometimes difficult to focus in low light conditions with the standard matte viewing screen. 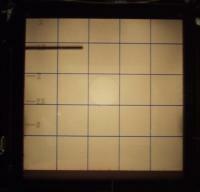 The use of a screen with a stigmometer can be helpful. The picture above left shows the scaled viewing screen. The dark line on the left is the mobile parallax indicator. It also indicates the exposure correction to be used according to the focusing distance on the scale visible on the left of the screen. The sound goes "crrrrrk clac". The crrrrrk is the sound of the winding/cocking crank, the clac is the sound of the shutter at 1/250 s.